Recommended batch video converter to convert videos in batch on Windows/Mac. Support 1,000+ video formats including MP4/AVI/MKV/MOV/MKV, etc. Download videos from YouTube and other 10,000+ video sharing sites by pasting URLs. Versatile toolbox combines Video Editor, GIF Maker, Fix Media Metadata, etc. A batch video converter is used to convert a large number of files for a specific device or for specific video editing software such as mobile phone editing apps. The batch conversion ensures that the files you are using are perfect for any kind of editing program. The Batch Video Conversion feature is introduced in the video converters for this purpose. In this article, we are introducing you to best batch video converters to convert all your favorite video files to a mobile-friendly version. The most ultimate tool that is used for batch conversion process is Wondershare UniConverter (originally Wondershare Video Converter Ultimate). This batch video converter allows you to convert many video files at a time and supports 1,000+ video formats. 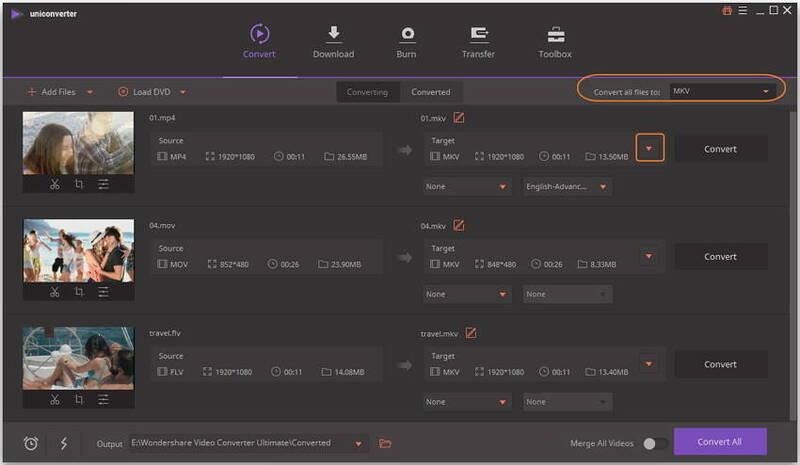 You can add several video files without space limited if you want to use batch converting. Wondershare UniConverter (originally Wondershare Video Converter Ultimate) is popular not only because of the amazing batch processor it has but also the multiple additional functions it can perform efficiently. It can be used as a video format converter, downloader, file burner, and for some other purposes related to media files. Batch convert video/audio files from one format to another easily and quickly. Support 1,000+ video formats including MP4/MKV/MOV/AVI/WMV and other common formats. Crop, Enhance, Trim videos with built-in video editor before conversion. Burn videos to DVD in batch with free menu templates and other customization points. Transfer video and audio files to iPhone/iPad/iPod and Android devices easily via USB cable. Additional toolbox with functions of VR Convert, Fix Media Metadata, GIF Maker, Cast to TV, etc. Supported OS: Windows 10/8/7/2003/Vista/XP, Mac OS 10.14 (Mojave), 10.13, 10.12, 10.11, 10.10, 10.9, 10.8, 10.7, 10.6. Download Wondershare UniConverter (originally Wondershare Video Converter Ultimate) and complete the setup and installation on your computer. Launch it and you'll come to the Convert main interface. Click the Add Files button on the left-top corner, a file browser will open and you can add your videos present on your computer. 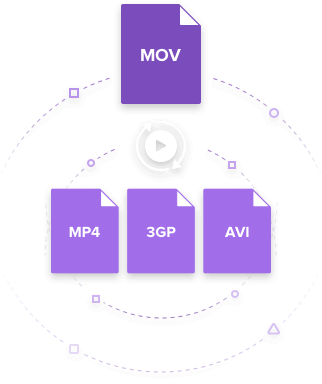 You're allowed to add multiple files at a time to batch convert video formats. 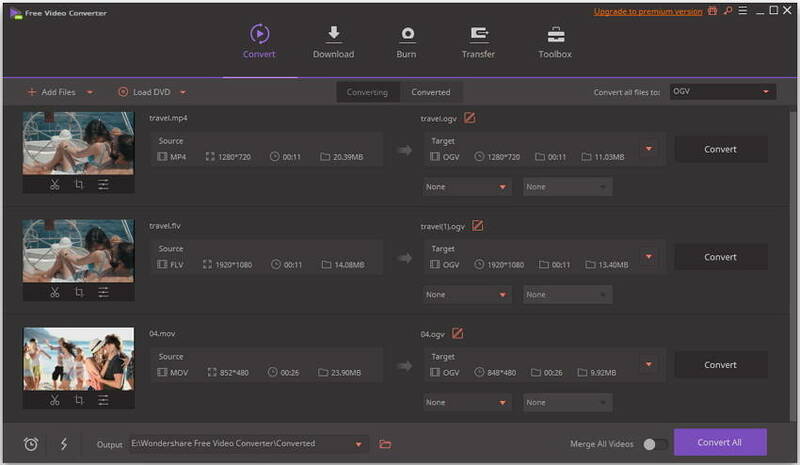 You can select the output video format by clicking the Convert all files to drop-down option, choose the video output format you need and all your files will be converted to this format. But you can also choose different target formats for different videos one by one, just click the drop-down icon on the Target information bar. After you have selected your output formats, go to click the Convert All button to convert all videos in batch. You can also convert them separately by hitting the Convert button. All your converted video files can be found under Converted tab. Whatever the needs and requirements are, some software always on the top of our list. And the same thing applies to the batch conversion process. 4 recommended free batch video converters are given below, with which you can convert videos in batch and for free. The Free Software is usually considered to be less worthy than the paid ones. But that is not the case with Wondershare Free Video Converter. The software is filled with features that would fit the requirements of user same as that of the Premium version. The only limitation is in the file size conversion. This free batch video converter is very popular among the users only because of the great functionalities it offers. It is compatible with both Mac and Windows Operating system. The Batch processing feature of the software is highly efficient. You can easily convert multiple files format at the same time with the help of Wondershare Free Video Converter. Other than the batch processing, the software also has other tools like video editor, downloader, DVD burner, and other small tools too. The interface of the free version is same as that of the premium version and it will give you same incredible user experience. You can always opt out for the paid version if you want to remove the limitation on the use of additional features. With the help of Handbrake, users have been converting video files from one format to another. But the feature that many people don't know is the batch processing. The Handbrake software is a tool that can also perform batch video conversion. Thus, you will be able to convert many files simultaneously without losing their original quality. Handbrake is a very effective batch video converter which is also an open source and free software which means that it has a complete support for all operating systems including Windows, Mac, Linux and others too. The software will easily convert all file formats and also allows the users to have a preview of the conversion. The software also has a simple editing tool that allows making chapter and having an option of selecting the chapter range. Additionally, it also supports video filtering and encoding too. Handbrake is a safe and reliable tool that can be easily downloaded on any computer. Even the interface of the software is so smart that users will love to have it. The only drawback of the software is that it doesn't support audio file conversion. Using Any Video Converter has made millions of customers happy as it is one of the best software for many user requirements. Whether it is the video format conversion or giving a high-quality output video, the software stands out in its features abruptly. This software is also very popular as batch video converter for Mac and Windows operating system too. The software can download video files from any online website and can convert them all together in a batch with its super-efficient batch conversion feature. Almost all the popular formats are supported by the software. Even the device support extends from Android to iOS devices and to Sony PSP, Apple TV, and Xbox One too. Moreover, the software is also capable of burning the media files to DVD. The best thing about using the software is that you will get reliable software which is also available in free version and gives a high-quality output. VLC Media Player has been a great tool for the users for a long time. But the uses of VLC have always been less known to the users. For the people who don't know that VLC can be used as batch video converter for Mac/Windows will be surprised to know this. The best thing about the software is that it is open source cross-platform software. It is not only designed to play the media files but also for other purposes too. The Batch Conversion process of VLC is the same regardless of what kind of format you are using. Even for the audio and video files, the process is the same. As we all know the video conversion and compilation of a large batch takes a lot of time. Hence, the batch conversion is a little bit slow as compared to other software but it can be of great help if users are unable to use other software.